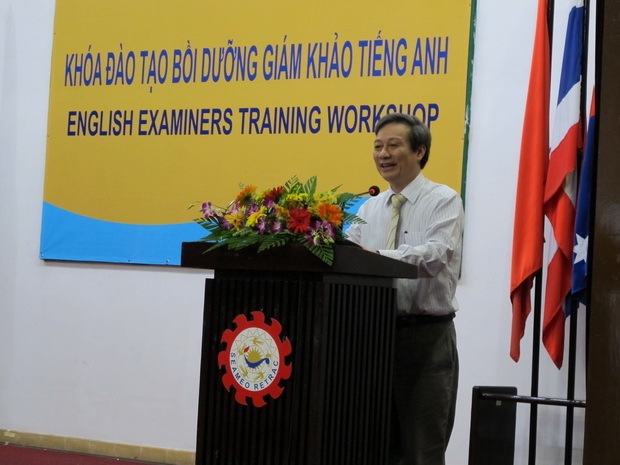 On December 3 to 7, 2012 an English examiners training workshop was jointly organized by SEAMEO RETRAC and the Vietnam’s National Foreign Languages 2020 Project (NFL 2020 Project) at the Center’s headquarter, 35 Le Thanh Ton Street, District 1, Ho Chi Minh City. Forty six selected lecturers from 5 universities in the southern part of Vietnam and SEAMEO RETRAC participated in the workshop. The five-day course aimed to train English speaking and writing examiners for the NFL 2020 Project. During the workshop, the participants had a chance to learn about the Common European Framework of Reference (CEFR), and to practice assessing English speaking abilities and rating English writing papers. The workshop was facilitated by Assoc. Prof. Carr Nathan, Assoc. Prof. Nguyen Phuong Nga, Dr. Vu Thi Phuong Anh and Dr. To Thu Huong. On November 27-29, 2012, the SEAMEO Secretariat, in cooperation with the Ministry of Education of Thailand, convened the 35th SEAMEO High Officials Meeting at the Grand Millennium Sukhumvit Hotel, Bangkok, Thailand. The meeting welcomed more than 130 participants who are high-level education officials from the SEAMEO Member Countries, Associate and Affiliate Members, SEAMEO Centers and strategic partners. Mr. Tran Ba Viet Dzung, Director General, International Cooperation Department, MOET Vietnam chaired the meeting. At the plenary session, high officials and the delegation discussed educational issues on education for all, disaster risk reduction in education, hygiene and water in schools, database on education, and increasing the efficiency of education systems. The education leaders also reviewed the 2011-2020 SEAMEO Strategic Plan and recommended specific actions to take for its implementation.The meeting also announced the next meeting of the SEAMEO Education Ministers namely the 47th SEAMEO Council Conference be hosted by the Government of Vietnam in Hanoi from 19 to 21 March 2013.